Recorded as from Connecticut. Descended in the family of the sitter. (Victor Spark, New York), by whom sold in 1947 to Edgar William and Bernice Chrysler Garbisch; by bequest to NGA, 1980. American Primitive Paintings from the Collection of Edgar William and Bernice Chrysler Garbisch, Part I, National Gallery of Art, Washington, 1954, no. 21. American Primitive Paintings, National Gallery of Art, Washington, D.C., 1955 (shown only two weeks and replaced). Little, Nina Fletcher. The Abby Aldrich Rockefeller Folk Art Collection. Boston and Toronto, 1957: 100-101. Black, Mary, and Jean Lipman. 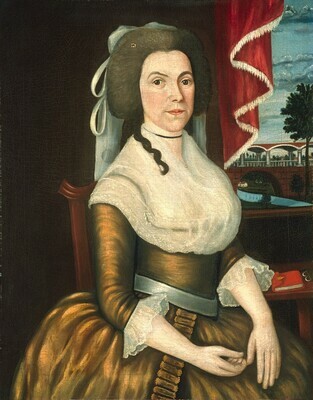 American Folk Painting. New York, 1966: 20-21. American Paintings: An Illustrated Catalogue. National Gallery of Art, Washington, 1992: 157, repro. Chotner, Deborah, with contributions by Julie Aronson, Sarah D. Cash, and Laurie Weitzenkorn. American Naive Paintings. The Collections of the National Gallery of Art Systematic Catalogue. Washington, D.C., 1992: 83, 86, color repro. 85.